First of all, I got this blog post idea from Lily over at pintsizedbeauty.com whose blog is basically just goals. I thought because I'm not really doing monthly favourites anymore I thought I may do these blog posts every month or so about what kind of books, shows and music I've been listening to over the past month/couple of months and it kind of shows something different from me and my blog because I know it's very beauty focused (which is just what I love writing about) but if I wasn't going to do a beauty and lifestyle blog for some reason, then music (or entertainment) would definitely be my second choice. I've got to say I've been lacking in the reading department, I have so many books to read and I keep buying or pre-ordering more but I just can't sit down and read at the moment, I don't know why. I've kind of been off reading since the end of this year and then I got back into it but it was short lived. I am about 1/4 of the way into Wide Like Me by Louise Pentland and I really like it, it's very down to earth and if you watch Louise's youtube channels or follow her on Twitter then you'll know what I mean why I say that you can tell that she has written the book. It's really funny but sweet. I hope that I can get back into reading again soon and this weird phrase of not being able to focus on reading will go away. I've been watching quite a few things over the past couple of months, so it's quite hard to condense everything. The fact that I was ill in bed for the best part of 2 and a half weeks because of sickness and then the following week I got a lovely full blown cold and I felt like a wreck, it gave me some time to watch some new movies and shows. 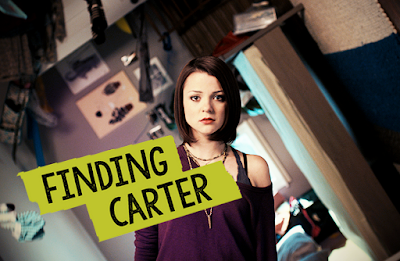 Whilst ill in bed I decided to start watching Finding Carter, I've heard quite a few people say how good it is. I didn't really know what it was about but you soon find out about 10 minutes into the first episode. To cut a long story short, it's about a sixteen-year-old girl who has been brought up by her single mother and has no other family members around, then one night whilst out with her friends, they sneak into a fairground and get arrested by police. The police then obviously contact family members and "Carter" soon finds out that she was actually abducted when she was three and then her world gets thrown upside down when her real parents come into her life and she has to move 2 hours away and meet her real family. It's really good and is one of those shows when you want to binge watch it. I'm about 6 episodes into the second season and it's just as good as the first season so far. I'm kind of gutted that it was cancelled last year. Okay, I'll admit Aidan Turner's lovely face did make me more interested in watching Poldark (lol) but I actually love it. I really like shows which are (loosely) based on real life history and I'd much rather watch a TV show about the historic events than a documentary (sorry documentary lovers!). 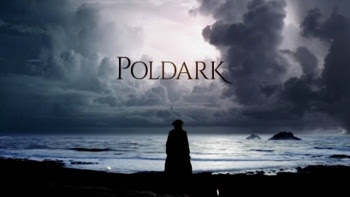 I'm sure you will kind of know what Poldark is about but if it's on your Watchlist and you haven't got around to watching it yet, I really recommend it. The first 2 seasons are on Netflix and the 3rd season boxset is on BBC iplayer. 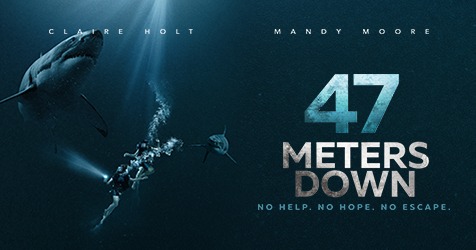 If you're a fan of the sea then I highly recommend not watching this film. It's basically made me not want to step foot in the sea ever again. It's about 2 sisters, Kate and Lisa who are on holiday in Mexico. Kate is more of the adventurous of the two and after finding out that Lisa and her boyfriend have broken up because she's apparently not fun enough, Kate suggests they go diving supposedly safe in their rusty-old "protective" cage. Obviously, the worst happens and their cage goes plunging 47 meters down with some not-so-friendly sharks making regular appearances. Just a little warning, if you have anxiety this will set it off like crazy because I was literally on the edge of my seat watching it, but it a pretty good film and I would watch it again and I don't usually like shark kind of films. I've been a fan of Royal Blood since they first came about, I had their first album on repeat for ages and the new album, I've been doing the exact same. I still can't get my head around how the two of them make so much noise. My favourites from the new album are - "Hole In Your Heart", "Don't Tell", "She's Creeping" and "I Only Lie When I Love You" (Yes basically the whole album lol). I saw these online on the BBC Introducing stage at Glastonbury playing "Align" and I loved it. So I searched for them on Spotify and they've literally not got a bad song in my opinion. I really like the Joy Division kind of 80's vibe about them. I hope they play a gig near me soon because I really want to go and see them. I really like the songs "Cut and Run" and "Smokescreen". So I think it was Radio 1's Big Weekend where they played and I saw that it was on TV and I thought I'd watch them for old times sake because I was a die hard fan of You Me At Six back when I was in high school. I haven't listened to them properly for years but not only was I singing along to my old favourite songs by them, I really liked some of their newer songs too, so I got their latest album Night People and I've been listening to it a lot lately. So there's some things which have been keeping me entertained over the past month or so. What books, tv shows/films and music have you been into lately?